What he says – is felt. What he dreams – comes true. What he believes – empowers lives. 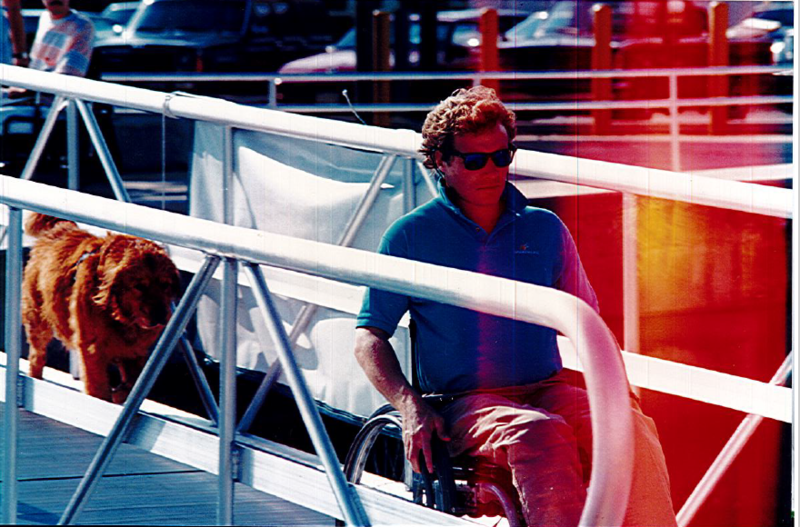 His name is Harry Horgan, president and co-founder of South Florida’s beloved watersports organization Shake-A-Leg Miami. On Biscayne Bay, a breeze blows Horgan’s curly hair to and fro and the waves rock his beloved boat. He smiles patiently as he maneuvers the wheel with delicacy and expertise. His bright sky-blue eyes and fine squint lines, resting in all the right places, disclose a rich history of service to others. Despite his indisputable accomplishments within South Florida’s diverse communities, Horgan is a quiet, humble man. He is the kind of person who deliberately gathers his enterprising thoughts before opening his lips. A naturally sturdy demeanor and soft soul encompasses his noble heart. To know Horgan is to be inspired by him. 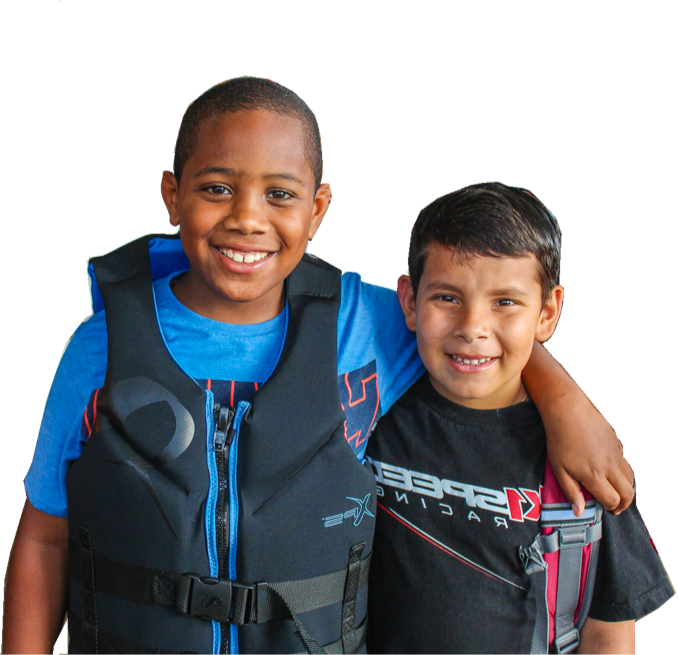 Partnering with the City of Miami, Shake-A-Leg Miami helps disabled children, military veterans and families embrace their special light and find their inner strength through unique, inclusive water sports programming. With 20 sailboats, 60 kayaks and several safety boats, the facility serves over 8,800 people annually. 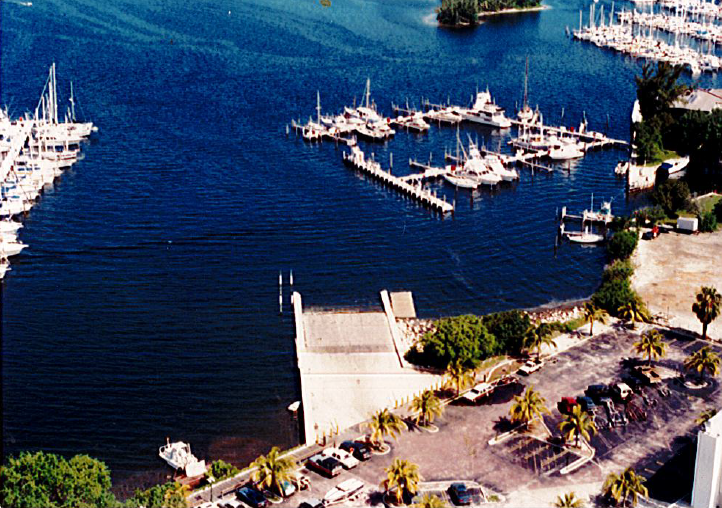 Situated in Miami’s Coconut Grove area with all its coastal assets and businesses, the Shake-A-Leg Miami facility attracts the eye with its historically significant former Coast Guard hangar, well-maintained dock area and inclusively designed boats and sailboats. Throughout the day, one will see people of all ages, abilities and backgrounds take part in all that Shake-A-Leg Miami has to offer. Horgan and his team welcome certified therapists, volunteers and family members to join them in assisting students who struggle with conditions ranging from autism to attention deficit disorders. 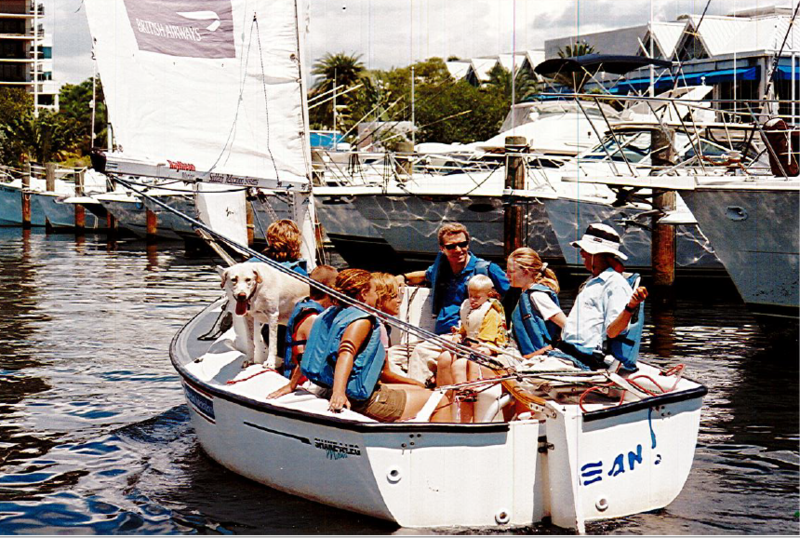 As a youth growing up in Rhode Island, Horgan took sailing lesson and developed a love for the ocean. After a car accident that left the 22-year old Horgan paralyzed, his life was steered in an unexpected direction – one that included rising above his challenges and founding one of the nation’s largest water sports facilities for the disabled. Following his physical rehabilitation work and graduation from college, Horgan recalls a vivid memory from a Colorado ski trip. “Flying down the mountain, I forgot I was disabled,” Horgan said. For many years now, Horgan has worked to recreate that feeling for others. From that one small, but extraordinary moment in Colorado, Horgan made a lifelong commitment to enable other individuals with disabilities to experience that same euphoric feeling and sense of freedom from their limitations. On Miami’s beautiful Biscayne Bay, water becomes the great equalizer for persons with physical, emotional or financial challenges. 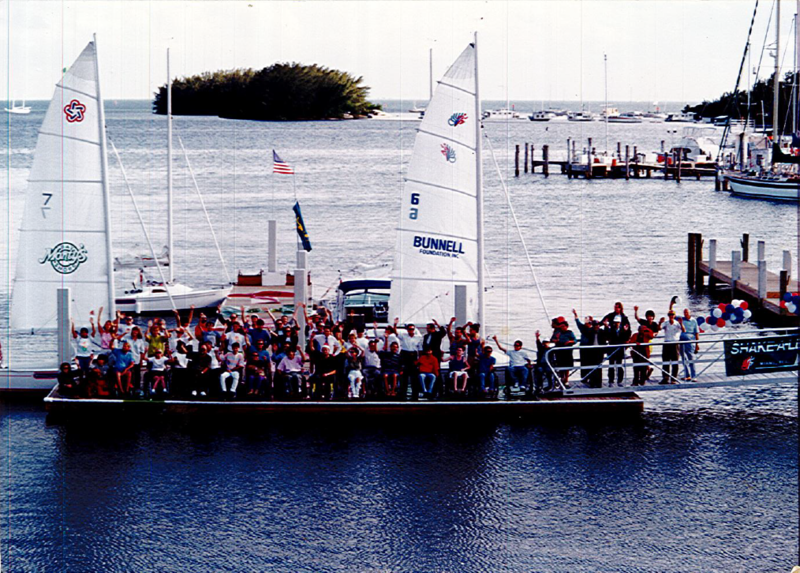 With Shake-A-Leg Miami’s help – participants enjoy the bay and experience freedom. 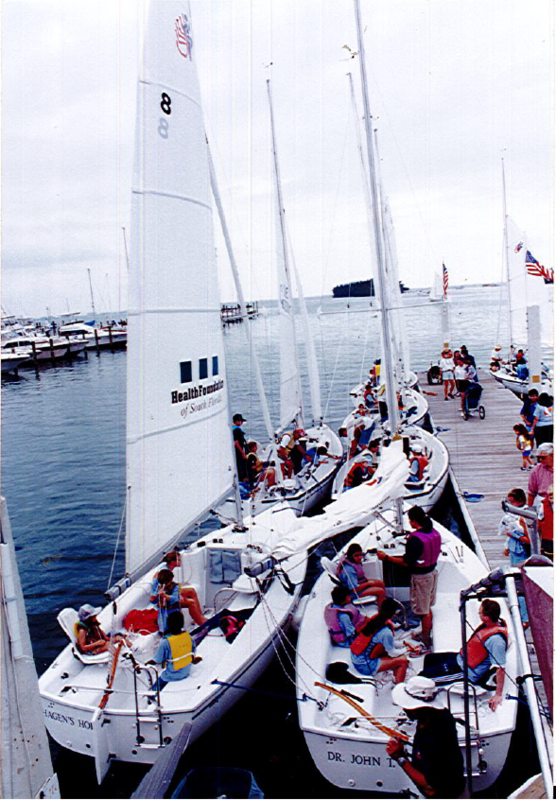 Though Horgan conceived of this unique organization while still in Newport, Rhode Island, 1990 officially marks Shake-A-Leg’s founding in Miami. It took a leap of faith and advice from his doctor for Horgan to make the move to South Florida. The location of the city provided him with the opportunity to host his innovative programs throughout the year with less weather disturbances. Thanks to the commitment offered through a $4 million Miami-Dade County “Project Safe Neighborhoods” grant and other foundation support, the Shake-A-Leg Miami organization bloomed. Word spread around the city, and soon, Miami-Dade County Public Schools stepped-in to form a relationship with the organization. 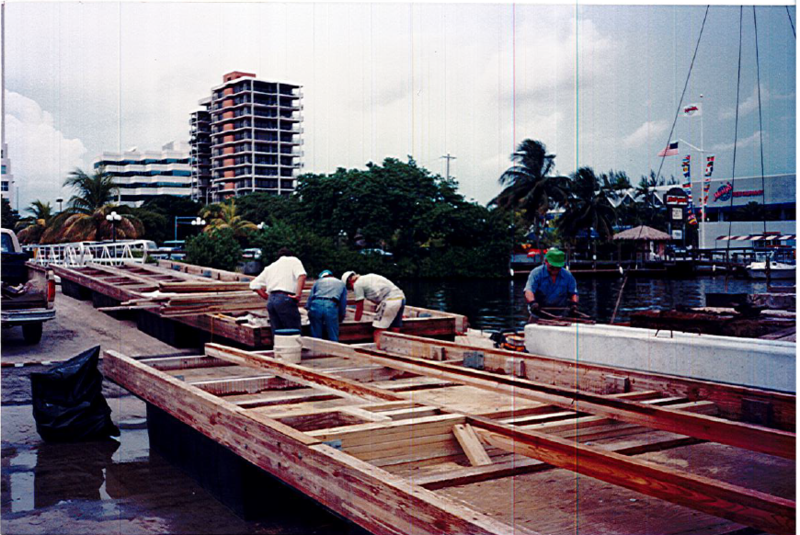 1996 was the year that Shake-A-Leg Miami launched its initial programs to serve students with disabilities. Shake-A-Leg Miami’s recognition increased once again when it hosted the World Blind Sailing Championship from October 16th through 23rd in Miami. The organization sent two Canadian volunteers to compete against individuals from other countries such as Argentina, Japan, Sweden, France, etc. Horgan’s vision finally became a reality. 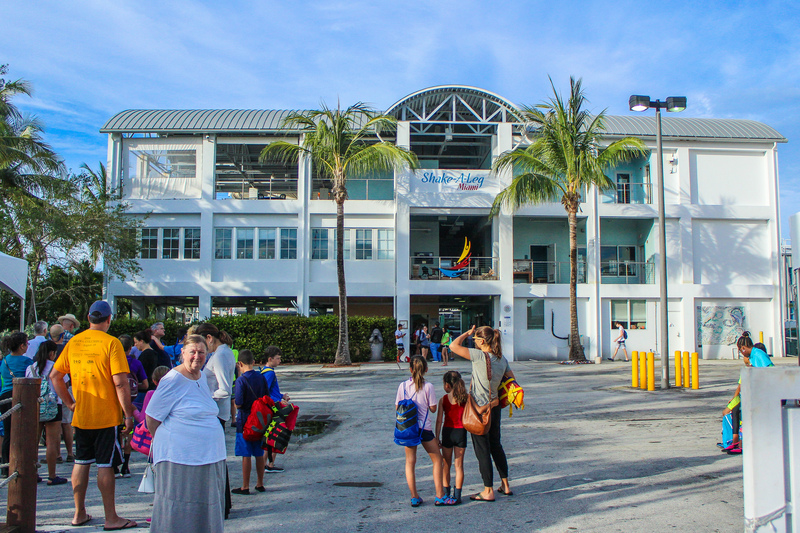 Apart from opening a universally accessible campus to the greater Miami community, a 60-foot catamaran named Impossible Dream made Shake-A-Leg Miami its permanent sea base. This magnificent, inclusively designed sailing vessel serves individuals with special conditions and veterans, offering a fountain of inspiration for the community. Sailing along the eastern seaboard, the boat coincides with Horgan’s goals of spreading awareness to individuals who are in need of improving their quality of life through an experience with the sea. Turning salt into sugar once again, Horgan and the Shake-A-Leg Miami team enrolled 20 children into the Eco-Adventure Island summer program with the goal of helping to restore “Mother Earth Island,” which is a small island located within the mangroves of the Biscayne Bay. Running from June 11 through August 17 each year, children now have the opportunity to wade out into Biscayne Bay through a variety of forms while soaking in information about the marine environment. In addition to their many water sports programs, Horgan opened a “Health and Wellness Center” to empower individuals through proactive physical, mental and spiritual engagement. The center provides a space where those with disabilities can enjoy performing yoga and strength training. Five hundred people within the Miami-Dade community gathered mid-October to celebrate Shake-A-Leg Miami’s 25th Anniversary, collecting more than $150,000 in donations. Models strutted the runway stage, showing off clothing taken from recycled sails. These “models” included many individuals with disabilities, exhibiting Shake-A-Leg Miami’s continued commitment to support an inclusive community. On September 10, 2017, Hurricane Irma rocked South Florida’s marinas into destruction. It tested the strength of humanity and the Sunshine State’s sanity, wiping out thousands of boats. For Shake-A-Leg Miami, Hurricane Irma badly damaged four boats and nine sailboats. The bond people share with Shake-A-Leg Miami goes beyond words. Horgan and his staff decided to turn this unforeseen circumstance into a learning experience. 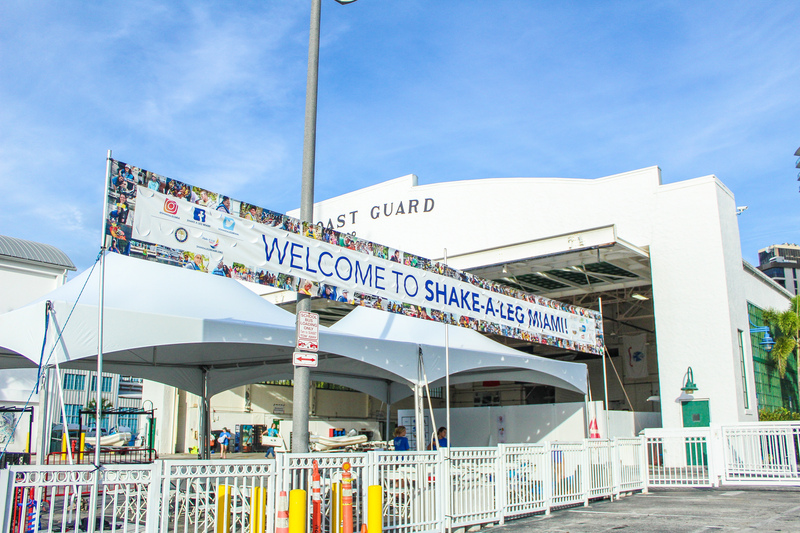 Expanding beyond its sailing and paddling programs, Shake-A-Leg Miami enlisted the help of its participants, local organizations and community volunteers. This newly formed team was able to fundraise $50,000 to rebuild the docks and get their boats back in serve. 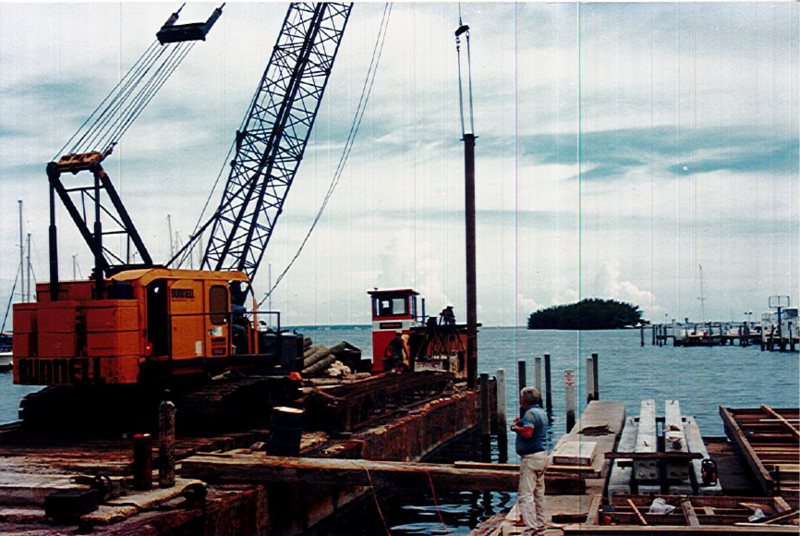 Currently, there is still much to be repaired and more money to be invested; however, more than a year later, Shake-A-Leg has demonstrated its endurance and resiliency. Empowered and determined, Horgan continues to take Shake-A-Leg Miami’s purpose even higher. The organization is currently developing a network with its community partners, who will have the opportunity to share their expertise and resources with individuals in need and also to strengthen Shake-A-Leg Miami’s distinguished reputation nationally. In the years to come, Horgan wants to innovate new programs and reach those in need globally. 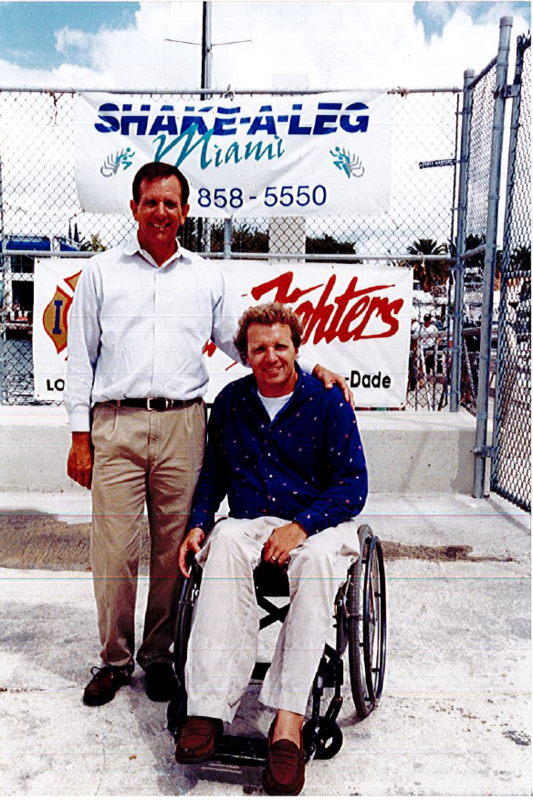 The reopening after a dock replacement in 1999- Horgan with Bill Mauk, one of the founding board members.